You want to know how it happened? The answer is - the way it always does. I have a really good idea. And it turns into trouble. Will and Luke are bored. When they hear about the student parade going through town, Will spots an opportunity for mischief. And Luke, as always, is easily led. Help Key Stage 3 students move from Level 3a to Level 4c in reading. Support comprehension with the engaging, age-appropriate illustrations. Encourage shared and guided reading using the ready-made tasks and discussion points on the activity pages at the back of the book. Suitable for Key Stage 3 students with a reading age of 9 years and 6 months. 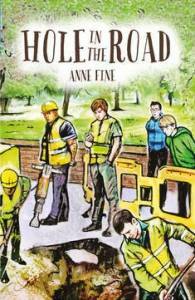 Hole in the Road is a book by Anne Fine for solo readers. It was published by Collins Educational on 20th February 2014. Click the logo to order Hole in the Road from .